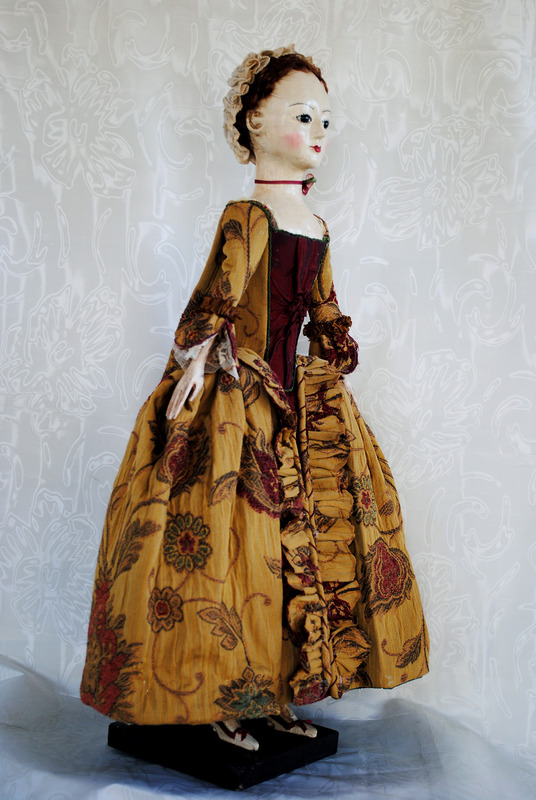 Lady Gwendolyn is 22 inches tall and wears a beautiful sack back dress, of the most lush fabric a gold ground with wonderful embroidered floral design. The dress is lined with green silk . 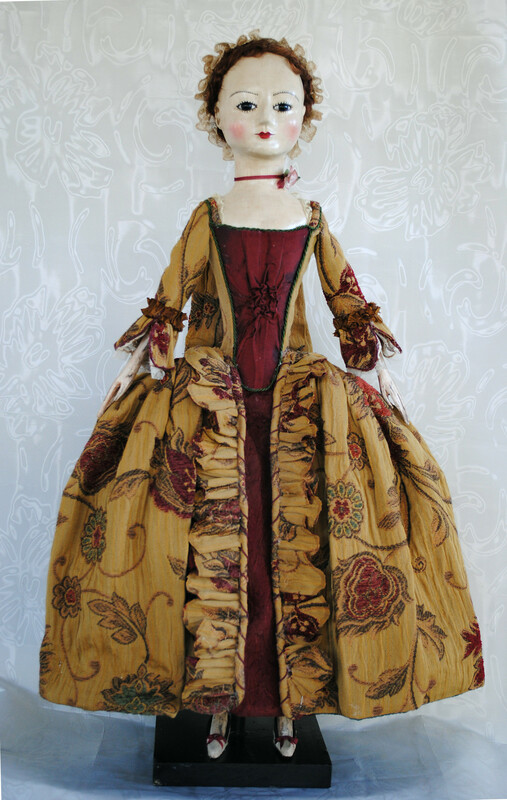 I trimmed the gown with hand pinked ruffles down the front, it is backed with red silk. Her cuffs are also hand pinked trimmed with a fine red silk thread and over a fine antique embroidered lace edged with a gold pleated ribbon. Her stomacher is red silk with a shirred rosette in the center the stomacher is trimmed with a braided combination of green silk threads. 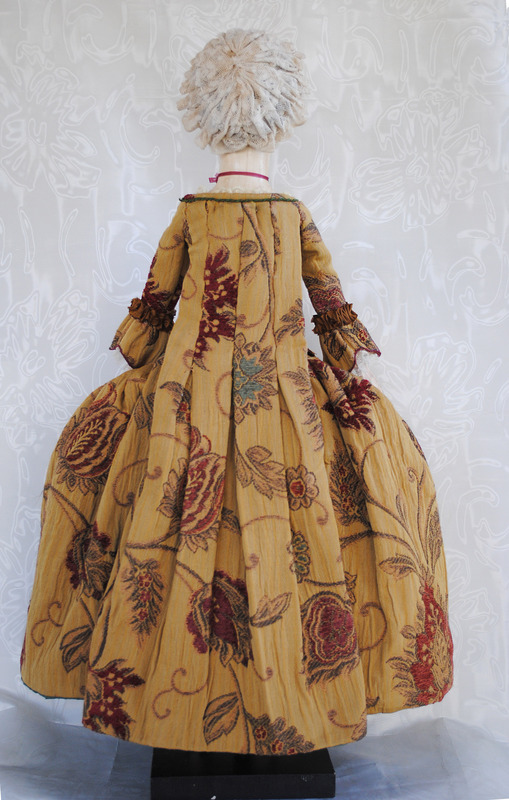 Her under skirt is a lovely quilted matelasse in a deep red to make the wonderful dress fabric really stand out. her shoes have heels and are hand sewn tan leather with red silk ribbon trim, because the doll was larger I was able to make real shoes. hand sewn human hair wig and lace bonnet. As are all my dolls made completely by me I turn the torsos and carve the hands and legs. I enamel the eyes, carve the face and paint them I do all the dress design and sewing as well so if you have any questions please call or email me . You did a wonderful job! I love this! How much is it? wow she is just wonderful.